The kindness bag project 2018 was a huge success! Together, we collected enough toiletries and other necessities to fill up almost 400 bags! A huge round of applause to all the kids who lovingly donated their time to decorate the kindness bags. Some of our New Canaan families took several bags to fill up themselves. What a wonderful thing to do and at the same time teaching the kids to give back and be kind to someone in need. Thank you for all the generosity. The kindness bag project wouldn’t be possible without the help of our willing and eager B kind club members. Thank you for helping collect the donations. Our club members from St. Luke’s school deserve some extra applause for staying after school the day before their holiday break started to put together all the kindness bags. You are all amazing kids! 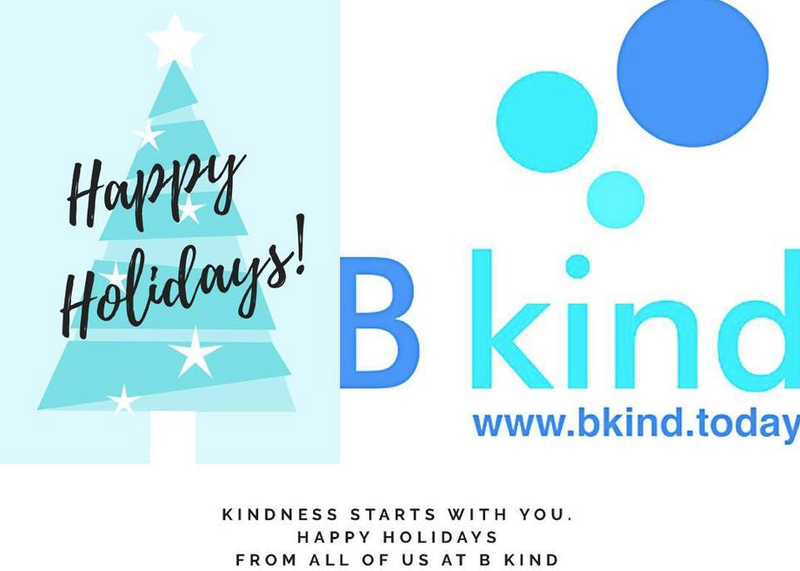 Happy Holidays from all of us at B kind! Holiday Sale going on now through December 18! Save 25% off on all B kind merchandise! Please visit our store site for great gift ideas. All proceeds go to the B kind foundation scholarship fund. Use code BKIND25 at checkout! Do good and give good! Thank you for all your support. If you have been following our instagram feed, then you know that we love inspirational quotes on kindness. If you are not, go ahead and follow us at @bkind_today. It is important to understand the positive effects kindness has in our lives. Kindness is a contagious act. When one exhibits kindness toward others, it spreads quickly like wildfire. 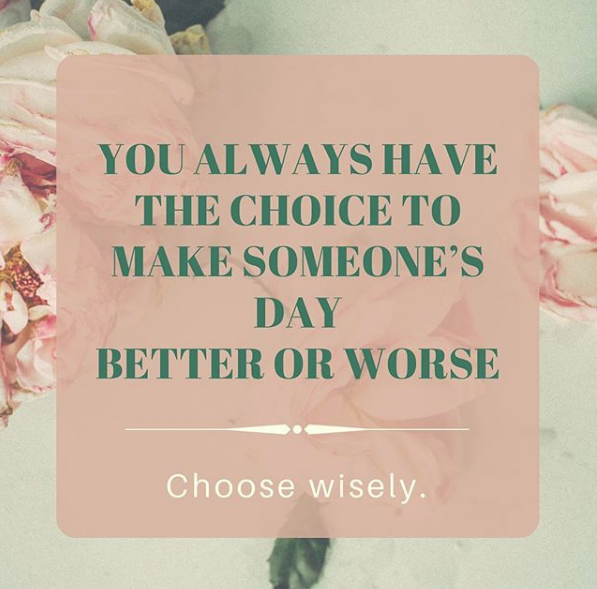 Personally, I like to be reminded every now and then how kindness affects our day, our lives, and how it can even change or affect another person’s outlook for the day. Here are some of our favorites from instagram. Please feel free to copy and share. SIGN THE WORLD KINDNESS PETITION TODAY! 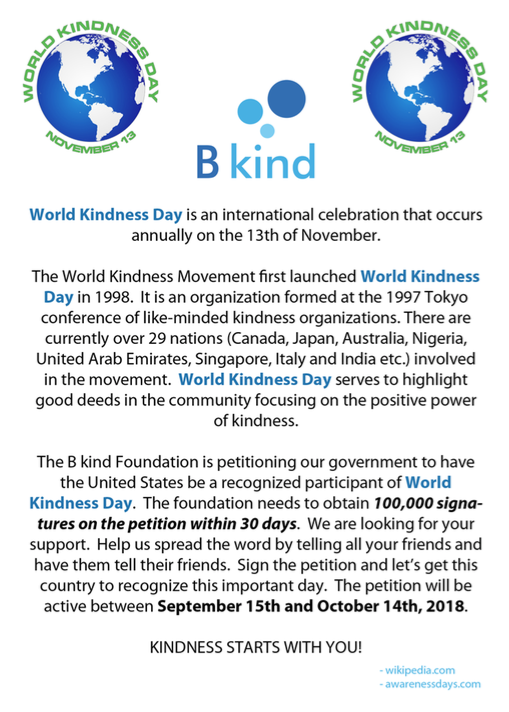 The B kind Foundation (www.bkind.today) is petitioning our government to have the United States be a recognized participant of World Kindness Day along with other member nations. World Kindness Day is celebrated every 13th of November and serves to highlight good deeds in the community, focusing on the positive power and the common thread of kindness. World Kindness Day was introduced in 1998 by the World Kindness Movement whose mission is to inspire individuals towards greater kindness by connecting nations to create a kinder world. The B kind Foundation is urging the government to officially add the United States along with the 29 other nations that observe it internationally each year. We need 100,000 signatures in 30 days to make this happen. Sign the petition today! World Kindness Day in the United States - we can make this possible! World Kindness Day is internationally observed on the 13th of November each year. It was introduced in 1998 by the World Kindness Movement that consists of like minded kindness organizations. Currently, 29 nations are involved in the movement. The United States is currently NOT a recognized participant. The B kind Foundation is ABOUT TO CHANGE THAT. World Kindness day focuses on good deeds and highlights in the community. It encourages and spreads acts of kindness everywhere. We want the United States to officially become part of the movement. YOU CAN HELP MAKE THIS HAPPEN. The B kind Foundation is petitioning the government to have the United States become a recognized participant of World Kindness Day each year on November 13th. WE NEED 100,000 SIGNATURES IN 30 DAYS. The petition will be live from September 15th through October 14th. WE NEED YOUR HELP. Please sign the petition when it goes live on September 15th. Sign it and pass it on through social media. We need this petition circulated as much as we can so we can obtain as many signatures as we can. We can do this and make this change happen if we do it together. Click on the button below to sign the petition. With the new school year around the corner, we also start another year with our B kind school clubs. Each club is expected to carry out the mission of the foundation and is structured around the Four Elements of Kindness which begin at the start of each quarter of the year. 1. Kindness to School: Club members are encouraged to do something good for their school. This includes not only to the school itself but also to their peers, teachers, and faculty members. One of our clubs at Sacred Heart School in Highbridge made kindness cards with positive messages that they gave out to friends, teachers, and faculty. 2. Kindness to Community: By giving back to the community, any act great or small, makes a huge impact. There are so many ways this element of kindness can be displayed. Volunteering at the local food pantry or donating food and/or clothing to shelters are just some examples. Our high school club at Brien McMahon in Norwalk, CT volunteered to clean up their local beach. They helped other volunteers pick up trash along the shore. The girls did an amazing job! 3. Kindness to Family: Family is the most important unit in one's life. What better way to say I love you to a loved one than doing an act of kindness for them. 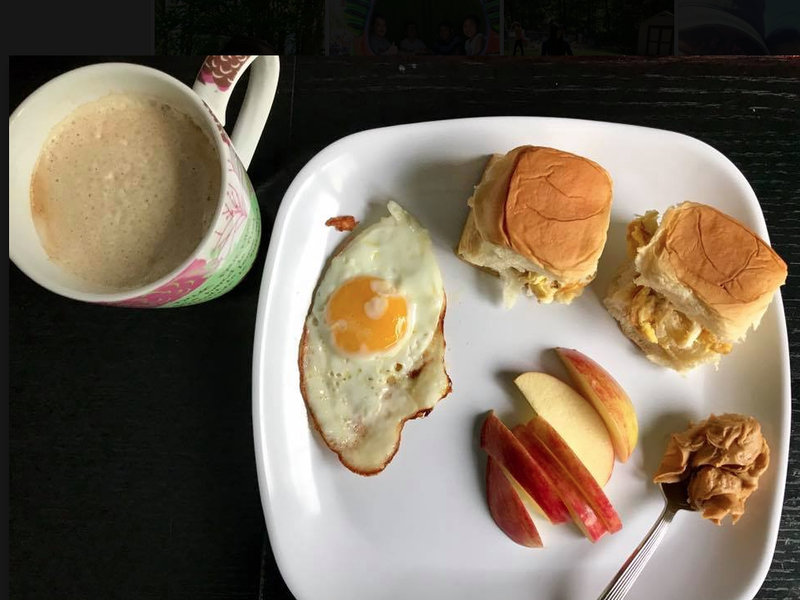 Every mother's day, my husband would get up early while I was still asleep and make surprise me with breakfast and coffee. This tradition has been passed on to our children now that they are old enough. It is may be a small and simple thing but a gesture that is so sweet and something I cherish year after year. There are so many ways to express kindness to a family member- cooking a favorite dinner dish, taking over someone's chore, surprising them with an unexpected treat - a win win for all involved. Mother's Day breakfast last year made by my kids. 4. Kindness to Self: the fourth and final element. This, in my opinion, is the most important element of all. How can one truly spread kindness if kindness does not exist within? 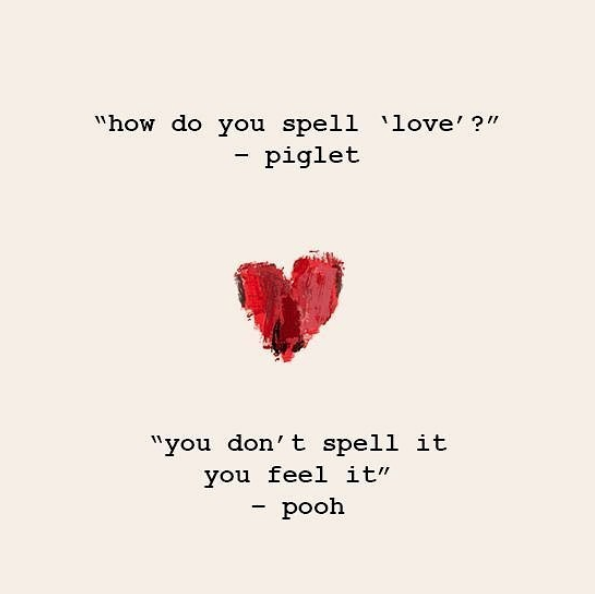 It is the same as saying, "For someone to love others, they must first love themselves". Steve Maraboli, a life speaker once said that "the most powerful relationship you will ever have is the relationship to yourself". I read this article in the past and it has a lot of really good suggestions on ways to be kind to yourself. One that stood out for me was practicing forgiveness. Without forgiveness, one cannot truly move forward in life or be free. If you or someone you know is interested in starting a B kind club in your school, please fill out this form so we can reach out to you with more information. The B kind Foundation recognizes a B kind club member each year for his or her services to the community and presents them with an award to help further their education. This humanitarian award, from an organization focused on kindness, is the first of its kind. The B kind Foundation is petitioning our government to have the United States be a recognized participant of World Kindness Day. Please subscribe to our email list. You will receive an email when the petition is live. Help spread it through social media. Email sherryl@bkind.today to have your email added to our list. If we help each other, we can make this possible. Throw Kindness Around Like It's Confetti! About a month ago, my friend Jeena's daughter, Issy, was suddenly diagnosed with a cerebellar tumor on her brain stem. Brain cancer. She is 12 years old. Fortunately, the tumor was localized and a team of surgeons at Yale Hospital were able to get it all. She is now officially "tumor-free" and in a rehabilitation hospital starting chemotherapy. A good friend of hers, Grace Bonita, an 12 year old entrepreneur, created a custom, handmade card for Issy. Grace is donating all the proceeds to Issy's medical fund. She is hoping that people will buy the cards not only to help with Issy's medical costs but to also give her dear friend some happiness and cheer from receiving them. Uplifting stories of kindness and friendship like this one with Grace and Issy are not only inspiring, they really tug at the heartstrings. Summer may be over in a few weeks but it isn't too late to do good things for good causes with your children. The experience will not only resonate with them through years to come but will also teach them the importance of kindness and selflessness towards others. 1. Hold a lemonade stand. Lemonade stands and summertime often go hand in hand. Make your lemonade stand different by picking a charity or cause of your choice to donate the proceeds to. A few years back, my children and I decided to "fund" a 6th grade math classroom with books and supplies for the year. 2. Organize a tag sale. One man's junk is another man's treasure, as they say. It's a win win situation. Get rid of things you no longer need or use and donate all the proceeds to charity. Whatever is leftover at the end of the day can be donated to Salvation's Army or Goodwill. This is a good chance for the kids to go through their own things and figure out what they can part with for a good cause. 3. Volunteer at a pet shelter. We were a dog family for many years and when our dog passed away, my kids wanted to do something in her memory. We worked with PAWS, a local shelter and helped them gather supplies needed for an upcoming adoption day. There are many ways to do volunteer work with animals, depending on the ages of your children. It can be as simple as buying and donating a bag of dog food. 4. Volunteer in your community. Reach out to your local chamber of commerce or recreation department to see if there are any events coming up where the kids can do volunteer work. If there are any, gather as many of their friends to join in. The more the merrier! Photo credit: New Canaanite. Teens from The National Charity League volunteer to insert 1,000 pinwheels for Domestic Violence Awareness. 5. Prepare for the new school year by doing something kind for your friends. Make some kindness rocks to give to each of them or a handmade card or note telling them how much you missed them over the summer. These little things may be simple but can mean a great deal to the recipient. One of my daughter's best friends have been away for 8 weeks, coming back home just a week before school starts. She has already gathered little items to surprise her with that she can use for school. There is no such thing as a simple act of kindness. EVERY act of kindness is unique and will mean a great deal to its recipient. Sometimes it doesn't only make their day, it can change their life. Kindness starts with you. It doesn't cost anything. Teach your children to always be kind and to spread kindness around like confetti! The B kind foundation participated in the annual New Canaan sidewalk sale, a beloved town tradition. Our goal was to promote B kind, its mission, and to encourage people to start B kind clubs at their schools or local organizations. We also talked to people about World Kindness Day and the petition from B kind. To make it a fun event, we put out a spinning wheel where new B kind facebook and instagram followers and mail subscribers can spin it to win a B kind merchandise. It wasn't long before people started to crowd our table. Throughout the day, the three of us who worked the table had the pleasure of meeting so many. Just when we thought working for a non-profit, kindness encouraging foundation has its lessons to share, we were pleasantly surprised at the number of people who graced us with their own stories to tell. Kindness starts at home. Yes, we know this to be true. How does one teach their children to be kind? One family who approached our table had with them their two young boys, the oldest not more than 10. Their parents made them listen as I talked about B kind's mission of spreading kindness everywhere. The younger boy looked at me and said, "We just had a lemonade stand at our house and we used the money we earned to buy toys for sick kids at Norwalk Hospital. Is that being kind, too?" I couldn't be prouder of this kid and his brother and congratulated their parents for raising such fine boys. I encouraged their mom to post the picture of the kids at Norwalk Hospital receiving their new toys on our Instagram page. I really hope she does! Kindness spreads like wildfire. One of our goals for the sidewalk sale is to obtain enough email subscribers so we can gather enough signatures for the World Kindness Day petition in September. All people had to do was read our World Kindness Day poster and they do the next best thing: subscribe to our email list. We didn't need to coax, beg, or plead. People naturally crave kindness and will do whatever it takes to spread it around. One family, in particular, was so moved by the upcoming petition that she signed up herself, her husband and two young children, to volunteer gathering signatures. Kindness is a mission that begins with yourself. Kindness inspires. We tried to encourage students who stopped by our table to start a B kind club in their school. We were more surprised when it was the teachers who expressed their interest in starting one and becoming its advisor. One teacher said, "You have no idea how much our school needs something like this." I told her that it isn't about the school, the town it's in or the students who go there that makes one B kind club more active than the other. It is about the kids inside the club who inspire each other to do kind deeds not only within the school but throughout the community. If that teacher knows kids who can see this through (I'm almost certain she does), then she will be successful in starting one. Another story from the sidewalk sale that I will gladly share is an act of kindness shown to us by a fellow vendor, Liza Paglialunga. Unbeknownst to us, she has been watching us throughout the day interact and talk to people. She sells these wonderful, one of a kind signs appropriately called Sweet Signs. At the end of the day, as we packed up our tent, Liza walks over and hands us three custom signs that she made just for us. It includes one that says "B kind" in the colors of our logo. I was able to thank her long enough to hand her one of our hats, a small gesture of gratitude. If you haven't done so already, please follow us on facebook, instagram, and subscribe to our email list for the latest updates. We thank you for your support! The celebration of World Kindness Day this year is on Tuesday, November 13, 2018. On that day, we will reflect on what kindness means to us, how it has touched and shaped our lives, and how we can inject kindness in the future. Too often, kindness is something we forget. It is not a physical entity so the constant reminder to be kind sometimes get overlooked. We must remember that "Kindness is a fundamental part of the human condition which bridges the divides of race religion, politics, gender and zip codes" (Wikipedia). In honor of World Kindness Day, the World Kindness Movement hopes that everyone will pass on an act of kindness to someone who will then pass it on to another, therefore creating a ripple effect of good deeds and kind acts that will create a better world for us all. The B kind Foundation is going one step further and will petition our government to have the United States be a recognized participant of World Kindness Day. There will be more details to follow in the next few months and we sincerely hope that you join us in this campaign. This is our intern Bailey O'Mara's last article for The Kindness Series. We have been so fortunate to have Bailey work with us the last month. He has proven that internship isn't all about working off your hours. It's about being passionate WHILE working off those hours. Bailey's previous articles, Part 1 and 2, made clear how important being kind has been in his life. Part 3 is his grand finale - showing how the children in our school system can implement kindness in ways that benefit not just the community or their school, but through themselves that they can continue on in life. Kindness is the root of a healthy community, allowing for growth, productivity, and a natural sense of fulfillment after tiresome work. The application of kindness extends far beyond random interactions, because kindness is part of the foundation of happiness, motivation, and success. Almost everyone has experienced a sense of community, in the work environment of an office, the team atmosphere of sports, a sense of school spirit in High School, or even as simple as being part of a family. In each of these situations kindness has a massive role, specifically in maintaining cooperation, constructive dialogue, and healthy relationships. The importance of kindness cannot be understated and we must recognize the necessity to foster it and continue to act kindly. An effective way to grow kindness is through random acts, consistent good deeds, and organized programs. Dedicating your time to tutoring, volunteering, raising money for non-profits, and organizing supply drives, has a tangible effect on the community. In previous articles I explained my own personal experience with tutoring and the neurological effects of kindness. Now I want to present an opportunity for others to have a positive effect on their community and spread kindness. B kind is a non-profit foundation dedicated to “encouraging acts of kindness in our everyday lives. We believe that even the smallest acts of kindness are worth recognizing, worth celebrating, and worth building a community around. Being kind can change someone's life. It can also change the world”. As a part of their mission, B kind organizes and facilitates the establishment of B kind clubs in schools all over the Northeast, with the goal of creating a positive change in the school environment and the surrounding community. At your school, find out the requirements for starting a club. Ask a faculty member to be your advisor. Create an Executive Committee of your peers. "B kind Club Application" should be filled out by all who want to start a club. 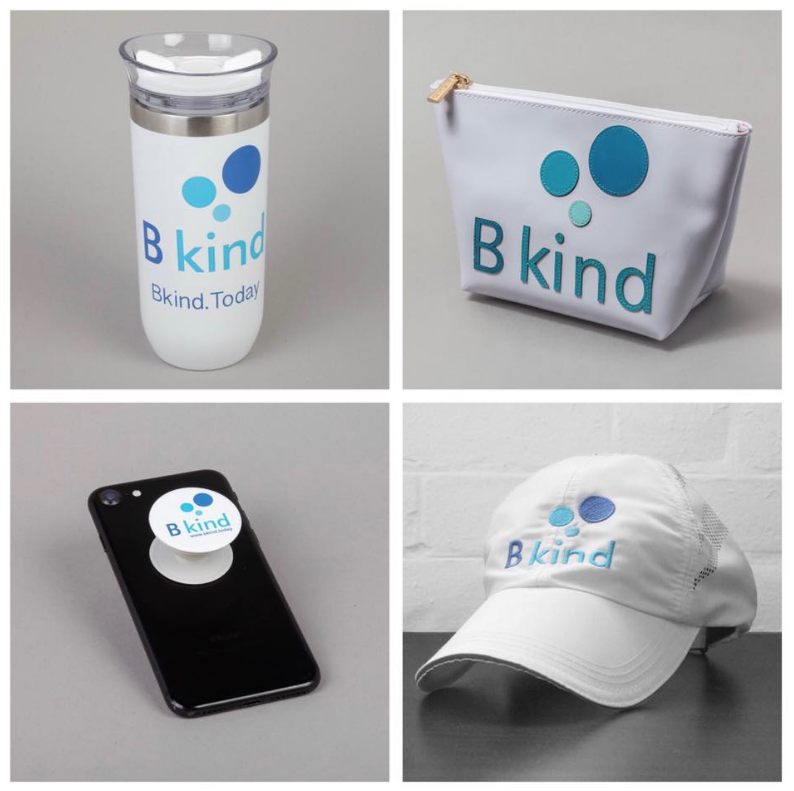 After creating a club, the members have the opportunity to use the B kind foundation resources, products to fundraise, and connections to other nonprofits, to volunteer and fulfill the four elements of kindness. Each element corresponds to a school quarter: school, community, family, and self. Furthermore, each year the B kind scholarship program recognizes an outstanding student (graduate) who exemplifies leadership in kindness throughout their school community and bestows a scholarship to further their education. Kindness is the foundation of positivity, happiness, and a healthy atmosphere in every environment. Starting a club is great way to work towards creating a school, community, and a world full of kindness. For more information on the B kind foundation or how to start a club, please visit B Kind Today or contact us here. What does it really mean to be kind? How do we learn it and what force drives us to execute kindness? Our intern, Bailey O'Mara, wrote a research article about this and came up with some interesting facts. The average person is unaware of the effect they have on the lives of those around them, mainly because of the natural human tendency to become infatuated with sequentially focusing on our personal tasks and challenges throughout the day. If we look at life with a macroscopic lense we realize every action has a consequence, whether or not we intend to cause change to our environment, it will happen. While we usually focus on our own experiences and the events of our lives, it is equally important to think about how we affect others. Considering this perspective on human interaction we could focus on the negative effects of our actions; for example, choosing not to throw out your gum but instead spitting it on the sidewalk, eventually causing someone to step in it, ruining their shoes. This is merely the initial effect of our choices, those people who were upset, delayed, or frustrated by our actions are likely to then continue this mentality, which will in turn have a butterfly effect making even more people unhappy. On the other hand, the impact we have on the world around us can be utilized as a tool. If we choose to be considerate, responsible, and kind, the positive impact we have can be extensive. Learning these skills starts as a child, when the brain is developing our cognitive responses and habits. The ability to process kindness can be derived from two major aspects of early brain development, a child’s home environment and the learning they do at school. A study at the University of Wisconsin has determined “The brain is constantly changing in response to environmental factors… we can actually enhance well-being by training that induces neuroplastic changes in the brain” (Tenenbaum D). Neuroplastic changes affect the function and interconnectedness of the cells in the brain. The importance of the research conducted was a conclusion that specific teachable practices can “cultivate new connections in the brain and enhance the function of neural networks that support aspects of prosocial behavior, including empathy, altruism, and kindness” (Tenenbaum D). The practices can be as simple as observing empathy, giving gifts, and sharing, all of which are learned as a child. Kindness is hardwired into the neural circuitry of our brain, meaning that instead of learning kindness we simply need to develop and foster its importance from a young age. According to a recent study in Science, people who spend more of their income on others instead of themselves are happier. Other neuroscience studies focusing on the areas of the brain that are activated by pleasure have discovered,‘charitable giving’ causes these areas to ‘light up’ especially when it is entirely voluntary. Researchers concluded that the brain is responsible for the natural warmth we feel from kindness. Interestingly, another study on charitable giving discovered a connection between moral processing and charity. Those who volunteered more had developed a stronger bond between the “moral” and “reward” areas of the brain, making “altruism” feel even better in the future (Simon-Thomas). The circular nature of life is responsible for the spread of kindness, the shared observation from each of these studies is that the kindness we learn has a massive impact on our neural pathways, and as a result will determine whether or not we are kind and empathetic in the future. The importance of kindness extends much further than we consider, and if everyone contributes to their community, their home, and the people in their lives by performing one act of kindness each day, the impact of their actions will create a better world for everyone around them. Well done, Brien McMahon High School! You have done an incredible job this year and your community is better because of all your hard work. We can't wait to see what you have in store for next year! We at B Kind are fortunate enough to work with an intern for a few weeks. He is a wonderful young man with a bright future ahead of him. Our intern, Bailey O'Mara, is a graduating senior from Darien High School and will be playing Division 1 water polo in the fall for Fordham University. He has written for us three articles on kindness - The Kindness Series. "James" is the first of three and is based on Bailey's own personal experience. Kindness is a fundamental part of human happiness and is an innate ability to motivate, comfort, and share a profound sense of affection.Without kindness life would be bleak and unfulfilling. A natural sense of warmth is derived from feeling kind and making your fellow human happy. A recent experience with kindness made me reconsider the impact we have as humans on one another, and this is that story. James Wilson*, one of hundreds of students living in Norwalk, Connecticut, is constantly working to balance his dedication to school work with all the opportunities to shut down, stop studying, and turn towards drugs or alcohol. The influence of drug abuse in and out of school is rampant, teenagers no older than 13 hiding marijuana in their sunglasses cases and fueling their addiction to nicotine with juul and vaporizers. These are his peers, and their slowly increasing detrimental influences are reflected in James’ change from an excellent student in Middle School to a less than scholarly start in High School. James has every reason to create excuses for his decline. He could blame the distractions of living in high density housing, a 2 bedroom apartment with four other siblings. He could blame the bullying and the thugs who beat him up on the train tracks after school. He could blame his family’s low income.Yet, James isn’t an ordinary kid, he looks past all of this blaming no one and nothing, instead working to correct his academic trajectory. I am James’ volunteer tutor at Norwalk Grassroots Tennis and Education, a program for underprivileged youth in Norwalk, a seemingless insignificant part of his life compared to the hundreds of daily stressors and temptations he encounters. An hour a day of studying, doing homework, and working has a large opportunity cost, he could be playing football with friends, or making money trading clothes. For me, James was an amazing guy, even though he was routinely late and chronically sassy, I appreciated his ability to overcome obstacles and his friendly demeanor. James is a young, slightly chubby, mixed race teenager, one of many in his area. It would be easy for him to fall through the educational cracks unnoticed. In February, on our first meeting, he was 15 minutes late, unprepared without his homework, and obviously unenthusiastic. His recent difficulty in school had clearly caused him to waver in his love of learning. He was passing only three of his five classes, and didn’t have a concrete work routine. Although he wasn’t ecstatic about working with me, we had a mutual understanding to dedicate our time to work. Months passed of two day weekly meetings, and hours of homework. Over the time we grew to be a solid team, catching up on our day at school, getting work done, cracking jokes, and shaking hands goodbye at the end of each session. As the school year wound down, we played basketball for 15 minutes at the end of each session, growing to be friends. Summer rolled around 12 months ago and the tutoring stopped because of new academic and athletic commitments. With a new year and new obligations, there was no time when our schedules aligned. James was on his own this school year. A few weeks ago my mother and her friend were eating lunch when a woman approached her, Helene, one of the women who run the tutoring organization. As she talked to my mother about my work with James tears began to well up in her eyes. My impact had extended much farther than I had believed. For me it was two hours a week of extra homework and sitting down to help James’ organization skills, but for James it was much more. According to Helene, this year James had become kinder, a more reliable student, and an approachable person. James began passing classes again, staying out of fights, and showing up to study on time. This story is one of many, not unique. A simple act of kindness each week can have repercussions that extend into the future and into the lives of more than just one other person. The ability to dedicate a seemingly insignificant amount of your life to another person through tutoring, raising money, or organizing supply drives, can change the lives of many. I urge you to consider your possible impact on your community, your friends, your family, and everyone in between, and donate your time to show them kindness today. * James Wilson is a fictional name created to protect the student’s real identity. Congratulations to Melanie Nunez, our B Kind Club recipient at Sacred Heart School! Our B Kind Club at Sacred Heart School had their last club meeting of the school year last week. What an incredible year it has been for the kids! Club member Melanie Nunez was presented with the B Kind scholarship award for the school year. Advisor Matt Gaboury shared that one of Melanie's essays also won a prize that week and off she will go to a Yankees game! Well done, Melanie! As they wrapped up their final club meeting, Matt gave each student a "Kindness Notebook" to start their Summer Kindness project. They are to write a list of projects in their notebook of things they want to accomplish including acts of kindness. We are so proud of all our B Kind Club kids at Sacred Heart. A great job to all and we are looking forward to seeing what you have planned for the next school year! 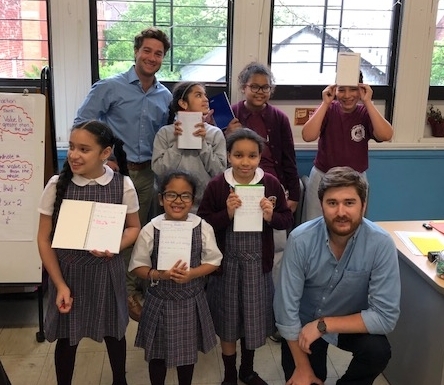 Advisors Matt and Patrick with the students and their Kindness Notebooks for their Summer Kindness Project. To call Bill Mahoney a kind man is an understatement. He made friends and strangers smile and laugh with compliments and funny jokes. He was the life of the party and the after party. People would form a circle around him as he told his many stories and shared his life lessons. His generosity knew no bounds. He donated money to numerous charities, helped family and friends, and picked up too many dinner tabs. His influence would change the course of people's lives for the better. He was a great boss and a mentor to many. One of his mentees is my husband Chris who wrote this article about Bill. It is a genuinely sweet tribute to a man whose impact on his life was great, as was his loss deeply felt. This is who Bill Mahoney was all about. We hope to honor his legacy by continuing what he did every day of his life: being kind. Bill wrote this letter on his last day as an executive at Bridgewater Associates, the world's largest hedge fund. It has been read and shared numerous times. If you have a few minutes to read it, I urge you to do so. In true Bill Mahoney form, it is inspiring as it is heartfelt. Friday was my last day of work at Bridgewater and maybe my last ever. Like most guys my age who grew up middle class in a small town I started working young with paper routes, shoveling driveways, mowing lawns, washing windows and such at age ten. The prospect of calling it quits after thirty-nine years of the stuff is makes you reflect over it. My work experience by most standards would be considered varied. I had my hand at the following to either put a roof over my head or pretzels and beer in my gullet: tug boat tender, bartender, construction day laborer, investment banker, busboy, softball umpire, security guard, speech writer, roofer and most recently Director of Marketing for the world’s fastest growing money management firm. “All work is noble”, my father used to tell us as kids and I believe it today. All the jobs we have had in our life (or lack of) no matter how seemingly unrelated has prepared us to fail or succeed at our current one. With few exceptions, I have enjoyed all of my jobs and was grateful to have them at the time. Several themes on how to be fulfilled in a working life have made themselves apparent to me. I will share them with you. Keep your job in perspective. Don’t tie your self-esteem up with your success at work. I don’t think that the most memorable line of any eulogy was “He was a very productive worker.” Be a good husband, father, neighbor, friend and person. You have control over that every day. There is too much outside of your control in the workplace to have it be a reliable barometer of your life’s worth. I have seen really talented great people fail at jobs and some bums inexplicably make good. Go figure. Keep your income in perspective. Be thankful for the fortune you are making and don’t resent the one you are not. I remember at Bankers Trust in Australia handing a $750,000 bonus to someone who stormed out of the room threatening to quit and five minutes later having someone tear-up telling me that their $30,000 bonus would change their life. Fairfield County is the world’s breeding ground of compensation discontent for the overpaid. Read about what is going on in Darfur to put your life in perspective. Wake up every day and be grateful for being in the top 1%. Give to Charity. Allocate a fixed percentage of your income for charity every year. Start with two percent and increase that over time if your income increases. This should be in addition to whatever you give to your place of worship if you have one as that money is really a form of dues to an organization you belong to. Work truly is noble if you give some of it back. Making a fixed percentage crystallizes that it is an essential component of your life. Don’t wait until you are “comfortable” to start this. Do it now. Don’t be so grumpy. Smile a little bit more. Say “hello” or “good morning” as you pass by colleagues on your way to your desk in the morning. If you see the same person three times and you have not met them extend a handshake and introduce yourself. You would be surprised how much it can make someone’s day by saying that you like their new hairstyle. Treat people how you would like others to treat your brother or sister or parent or child. Lighten-up. Know your market. You sell your time and talents to your employer. Keep abreast of what the going rate is. It is not disloyal to take a headhunter’s call or speak with another company. If you do and believe that you are being under paid or over worked talk with your manager about it. They want to know as much as you. You might never know that the grass you are walking on is the greenest in town until you look over the fence. Do what you are good at. Most of the time people are unhappy at work because they are doing the wrong job. Pride, stubbornness or fear of failure keeps most people from shifting gears and taking the steps to work at what they are passionate about and thereby probably good at. There is usually a big difference between what you want to be good at and what you are really good it. Resolve that conflict. Don’t just work for a paycheck. Your work life will drag on forever. I think Giselle’s update a couple of weeks ago addressed this eloquently. It’s worth reading again. Utilize the richness of your colleagues. Bridgewater has a fascinating mosaic of employees. Have lunch with someone from a different culture, country or religion. Invite their family to your home to meet your wife and children. Make an ethnic dinner together and listen to music from their land. You will learn a lot more by asking a Hindu what the difference is between Christianity and Hinduism than by reading a book or newspaper article. Some of my most cherished memories of Bridgewater are when my family was able to do these things. Take a walk-about. This wisdom is imparted mostly to those without children. Although, never the poster boy of a model “company man”, I’ve done okay in business while having some fun along the way. After college, I made it a rule to work two and a half years then take six months off. I did this three times. The first time I bummed around Europe, the second time in the Caribbean and the third in Australia. While in Australia, I got engaged and the gig was up - good while it lasted. You are only young once. You will have plenty of time to make money. It’s a big world out there. Prepare yourself to leap. A successful business career is seldom a gradual upward sloping line. It is erratic, punctuated with dismal failures and moments of brilliance. I have always tried to impart on people beginning their working life that long hours, missed flights and the general crap you put up with are all small deposits in your personal success bank. Don’t worry about getting your 2% raise plus inflation every year. Look for and create opportunities to make more and more deposits into your success bank. When the time is right make your withdrawal and go for it. As you read this I am at Byron Bay beach five hundred miles north of Sydney, Australia swimming and surfing in azure blue waves with my beautiful wife, who broke my string of walk-abouts fourteen years ago, and my two awesome daughters who have truly given my life perspective since they arrived eleven and eight years ago. May all of you find what you want in work and life. Keep it simple. The Sacred Heart School B Kind Club located in the Bronx, NY has been off to a great start! Advisor Matthew Gaboury has done a tremendous job with his 10 club members (grades ranging from 2nd grade to 6th grade). They started off their first club meeting for the school year getting to know each other and writing Kindness Cards where they wrote down positive messages and distributed throughout the school. The lucky recipients were fellow students, teachers, or school staff members! Their second club meeting was a special one. They were doing The Kindness Rocks Project! This wonderful and inspiring project involves finding and painting large rocks, writing positive phrases and words on them, and leaving them throughout the school and community for people to find. The kids were thrilled to make them and they spent the rest of the meeting painting their rocks and thinking of what to put on them. By the time their third meeting came around, Matt surprised them with their painted (and dried) rocks plus extra rocks that he painted himself. Each child was able to have three rocks to write on and give out to the community! Hats off to Matt and the B Kind Club of Sacred Heart School for learning, giving, and spreading kindness. Keep inspiring us with all your good work. We can't wait to see what your club has in store for the next school year. If you are interested in starting a B Kind Club at your school, please contact us and we will be happy to help you get started! Teaching kindness in schools seems more important than ever before. Research shows us that by performing acts of kindness, both adults and kids experience a ‘helpers high’, or good feelings. This activates areas in the brain that are connected to happiness, social connection and trust. Feeling connectedness and trust has shown to be strong factors in increasing happiness in kids. With this in mind, we spent an exciting morning at West School in New Canaan, and kicked off the school year with a presentation and craft session with the ‘kids care’ club. It was wonderful to discuss the importance of kindness, and brain storm ideas on all the different ways the kids can be kind at school, in the community, with family and to self. The kids kindly decorated our B kind donation bags, and generously provided a wonderful assortment of dry food goods and toiletries (to be donated at a local shelter for the homeless). Kindness starts with you ! CELEBRATED WORLD KINDNESS DAY AT AN UPPER SCHOOL ASSEMBLY. THEN THEY HAD A PROGRAM FOR THE LOWER SCHOOL MENTORS; SOPHOMORE AND JUNIORS WHO WORK WITH THE LOWER SCHOOL CHILDREN. B KIND CLUBS ARE BEING ESTABLISHED ACROSS THE COUNTRY! CHECK OUT OUR SCHOOL CLUBS PAGE AND START A CLUB AT YOUR SCHOOL! JOIN THE B KIND MOVEMENT.